Here’s the pitch. George Clooney travels the country earning sky-miles on his airline while his company attempts to convince him his “old ways” are costing too much money. Sound like a movie you would want to see? I didn’t think so. 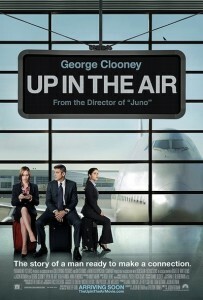 “Up In The Air” goes so far beyond the story, gazing deep inside the attitude and internal makings of the main characters. George Clooney, the movies leading man prides himself on being disconnected from everyone and everything. He doesn’t let family, relationships or friendships tie him down. With this simple premiss, Jason Reitman takes you through this mans story of personal growth in a very similar manner to “Thank You For Smoking” in which Aaron Eckert (“The Dark Knight”) plays Clooney’s role. There are a number of similarities in the two comedies (and a few with “Juno,” also directed by Reitman). With that said, “Up in the Air” distinguishes itself from “Thank You For Smoking” in the story. Main characters are developed more and this leads to a stronger personal connection with each of the characters. It interests me how movie goers will connect with Clooney’s character. His cynical view on the world is optimized by a speech he is famous for about a backpack. He talks about how this bag is filled with all of your personal “baggage” and how it’s best to light it on fire and leave it behind. Hard to relate to, Clooney portrays a person that very few people know. Either way, money is well spent in going to see “Up in the Air.” The killer combination of Reitman, Clooney and a fantastic story, make this the best movie of the month.